The deterioration of coastal coral reef was widely recognized by environmental activists as one of the biggest problems of Indonesia. That is why this is also the location of one of the world's biggest coral restoration projects, using a method known as electrical mineral accretion. The Biorock Project in Pemuteran was started in the year 2000 and since then it has become wildly successful, with fast-growing coral, a thriving marine ecosystem, and a huge tourism boost. Visitors diving and snorkeling in the waters around here are often inspired to donate money so that new metallic structures for the coral ecosystems can be created. The restoration project is located directly in front of Adi Assri hotel and can be easily accessed from the beach over there. It's really easy to check out as the water is barely 15 meters deep. If you don't want to pay anything, you can just snorkel and check it out. You can also go diving with an outfit for a small fee. Use a taxi bemo or ojek to get here. How popular is Biorock Pemuteran? People normally club together Banjar Hot Springs and Lipah Beach while planning their visit to Biorock Pemuteran. Nice restful beach. Locals are helpful but not intrusive, lovely gentle people who take care of the project well. Saw beautiful fishes of many species. Best to go early morning when the tide only begin to swell. Water is clear so you can enjoy the corals. Just rent your gears at the beach, it's effective n cheap including the under water camera. Our second visit here and we would love to come back again. Excellent idea, lovely place to try snorkeling for the first time. Better going at low go up tide. Great idea, you can see a good range of fish very close from the shore. Lots of plastic and dirt in the water when I was there though. So you constantly battling through filth while snorkeling. Without the filth, it would be alot better experience. 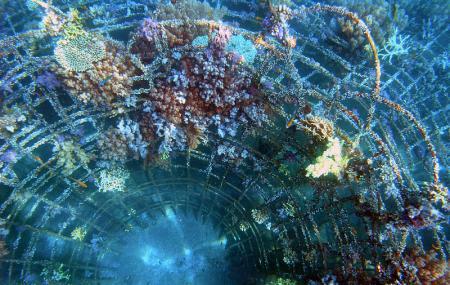 Biorock is a great project to restore the reef. They have a variety of objects which are powered by electric current to stimulate the growth of the corals. You can find them in all sizes, from tiny to big. It is not a huge colorful reef, but find a great spot for snorkling and observing all different kinds of coral and fish. If you are lucky, you might even see a turtle!